For more than 70 years it has been appreciated that cancer cells exhibit an altered metabolism that is characterized by elevated uptake of glucose and an increased glycolytic rate; this observation was first reported by Otto Warburg , comparing liver cancer cells with normal liver cells. 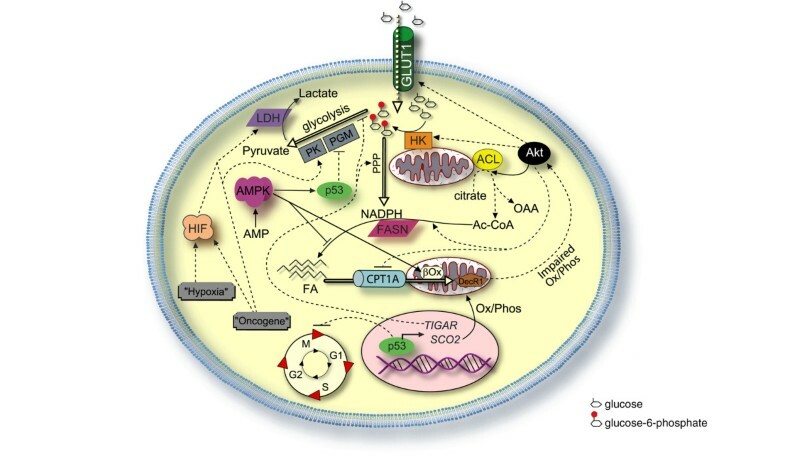 The observation that cancer cells generated the majority of their ATP by glycolysis, even when grown in the presence of oxygen, caused Warburg to hypothesize that the metabolic shift toward glycolysis observed in cancer cells reflected damage to mitochondrial respiration, which resulted in aerobic glycolysis. In normal cells the presence of oxygen inhibits glycolysis, as first recognized by Pasteur (the Pasteur effect) . Furthermore, Warburg hypothesized that this metabolic change was the origin of cancer, as reflected in the title of his report published in 1956 . It is now clear that the majority of tumor cells in vivo, and transformed cells in vitro, exhibit elevated levels of glucose transport and elevated rates of glycolysis that result in an increase in the production of lactate; this phenomenon is known as the Warburg effect. Glycolysis is a topic covered in virtually every biochemistry course because of its central role in biology and is summarized in Figure 1. During glycolysis, glucose is metabolized to form two molecules of pyruvate with a net gain of two molecules of ATP from one molecule of glucose. Under normal conditions, pyruvate is converted into acetylcoenzyme A to provide starting material for the citric acid cycle and oxidative phosphorylation, which yields about 34 more molecules of ATP from the molecule of glucose. Despite inefficient use of glucose, tumor cells often convert pyruvate to lactate, which is secreted from the cell, but this change in metabolism is prominent and would appear to result from rather strong selective pressure. Tumor hypoxia (lack of oxygen) will also cause a shift to glycolytic metabolism, because respiration cannot occur without oxygen. Tumor hypoxia and activation of hypoxia inducible factor (HIF) is undoubtedly an important pathway that contributes to tumorigenesis, angiogenesis, increased glycolysis and tumor cell survival. Additionally, HIF can be activated under normoxia by loss of the von Hippel-Lindau tumor suppressor (which normally acts to keep levels of HIF activity low under normoxic conditions) or activation of receptor tyrosine kinase signaling . HIF-1 inhibits mitochondrial biogenesis and cellular respiration in von Hippel-Lindau deficient renal cell carcinoma by repression of c-Myc activity . HIF activation not only stimulates glycolysis but also actively attenuates mitochondrial respiration, making HIF a key regulator of cancer cell metabolism [5, 6]. Factors that contribute to the Warburg effect, other than tumor hypoxia and HIF, are discussed further in this review; a number of recent comprehensive reviews provide extensive information about HIF activation and its role in cancer [7–12]. Hypoxia cannot be completely responsible for the elevated glucose transport and increased glycolysis observed in tumors cells, because these properties can be induced by oncogene-mediated cell transformation in vitro and are maintained when tumor cells are cultured in vitro under normoxic conditions. Interest in the Warburg effect has re-emerged in recent years, in part because positron emission tomography imaging has proven to be highly effective in detecting tumors and metastatic lesions in patients and can be used as an indicator of disease progression or remission [13–16]. Although many different tracers can be used in positron emission tomography, the diagnostic detection of tumors primarily utilizes the glucose analog 18fluorodeoxyglucose, which is effective because tumors take up large quantities of glucose. Cuezva and colleagues  demonstrated that tumors that transport less glucose (as determined by positron emission tomography) carry better prognosis in terms of patient survival than do tumors that transport more glucose. This group has also defined a 'bioenergetic signature' that is predictive of disease progression, correlates with high rates of glucose transport and decreased mitochondrial metabolism, and may identify therapeutic targets specific to a cancer cells' metabolism . In the present commentary, we review some of the recent advances that have led to new molecular insights regarding the Warburg effect and pose questions that merit attention in the coming years. Activation of the serine/threonine kinase Akt induces aerobic glycolysis by affecting multiple molecules that are directly involved in glycolysis while maintaining cell survival. Expression of an activated mutant of Akt1, namely myr-Akt1, in hematopoietic cells stimulates accumulation of nicotinamide adenine dinucleotide, reduced (NADH) and lactate (byproducts of glycolysis) and accelerates glucose consumption, and it does so without increasing cellular oxygen consumption, indicating that activated Akt induces aerobic glycolysis without effecting mitochondrial respiration . Similarly, paired glioblastoma cell lines with and without high levels of activated Akt proliferate at a similar rate, but cells with activated Akt consume more glucose and secrete more lactate, which can be inhibited by pharmacologic inhibition of Akt; expression of activated Akt in the cell line lacking Akt activation increases glucose consumption and lactate production . Thus, expression of activated Akt induces aerobic glycolysis in both neoplastic hematopoietic and glial cells. Analysis of knockout mice lacking specific Akt isoforms has shown that different Akt family members are important for glucose uptake and initiating glycolysis. The insulin-induced uptake of glucose by insulin responsive tissues such as skeletal muscle and adipose tissue requires Akt2 for translocation of glucose transporter (GLUT)4 to the cell surface and subsequent glucose import . Growth factor withdrawal causes interleukin-3 dependent hematopoietic cells to downregulate expression of GLUT1, hexokinase (HK)II, and phosphofructokinase 1, thus decreasing glycolysis by reducing glucose import and diminishing the activity of these two key glycolytic enzymes . The ability of interleukin-3 dependent cells to stimulate plasma membrane localization of GLUT1 and glucose import requires phosphatidylinositol 3-kinase (PI3K) [21, 22], but expression of myr-Akt1 can induce GLUT1 plasma membrane localization and HKI activity in the absence of interleukin-3 . In virgin mice, mammary epithelial cells lack basolateral expression of GLUT1; however, conditional expression of myr-Akt1 in the mammary gland in vivo induces basolateral localization of GLUT1 in virgin mammary epithelial cells, whereas mice lacking Akt1 fail to properly induce GLUT1 basolateral localization during pregnancy . Because the Akt pathway is activated in the majority of cancers (via over-expression of receptor tyrosine kinases , phosphatase and tensin homolog [PTEN] inactivation , mutation of PI3K , or mutation of Akt itself ), and because most tumors over-express GLUT1 in the plasma membrane and exhibit elevated glucose transport , this would suggest a causal role for the PI3K/Akt pathway in stimulating over-expression and membrane localization of GLUT1 in these tumor cells (Figure 2). Further studies are needed to confirm the role played by Akt in regulating glucose transport and glycolysis, especially given that glucose transporters can be over-expressed in breast tumors that do not express activated Akt . In addition to stimulating glucose import, Akt stimulates mitochondria-associated HK activity , which initiates glycolysis and the pentose phosphate pathway by phosphorylating glucose to form glucose-6-phosphate (Figure 1). Phosphorylation of glucose also allows for further transport of glucose into the cell along its concentration gradient. Growth factors promote the association of HKI and HKII with mitochondria , which can also be stimulated by expression of activated myr-Akt1, suggesting that growth factors utilize the PI3K/Akt/mammalian target of rapamycin (mTOR) pathway to regulate localization of HKI and HKII [31, 32]. Localization of HKI and HKII to the outer mitochondrial membrane is associated with increased phosphorylation of glucose, suppression of apoptosis and maintenance of mitochondrial membrane potential, and may link glycolytic glucose metabolism to oxidative phosphorylation via use of intramitochondrial ATP to phosphorylate glucose . Both glucose and HK activity are required for Akt-mediated suppression of apoptosis , indicating that Akt activation can mediate two hallmarks of cancer (Figure 2): glycolysis and evasion of apoptosis. Pyruvate can be converted into either cytosolic lactate, which is secreted, or into mitochondrial acetyl-coenzyme A, which is converted into citrate within the mitochondria. Citrate can be processed by the citric acid cycle or exported to the cytoplasm, where it is cleaved by ATP citrate lyase, generating cytosolic acetyl-coenzyme A, which is a building block for cholesterol and fatty acid biosynthesis. Additionally, high concentrations of cytosolic citrate inhibit glycolysis and shunt glucose-6-phosphate into the pentose phosphate pathway; this generates nicotinamide adenine dinucleotide phosphate (NADPH), which is a reducing equivalent necessary for cholesterol and fatty acid biosynthesis. ATP citrate lyase is a substrate for Akt , and expression of activated Akt enhances de novo synthesis of fatty acids from either glucose or pyruvate precursors, whereas inhibition of Akt decreases fatty acid synthesis . Inhibition of PI3K/Akt signaling enhances β-oxidation (catabolism) of fatty acids, whereas expression of myr-Akt1 inhibits β-oxidation of fatty acids by reducing expression of carnitine palmitoyltransferase (CPT)1A, a key enzyme that is involved in transporting fatty acids to the mitochondria for β-oxidation . A simplified model that incorporates the above observations would suggest that activation of Akt dynamically reprograms the cancer cell by supplying the cancer cell with energy via enhanced glucose uptake, stimulating hexokinase activity and glycolytic processing of glucose; by suppressing apoptosis; and by suppressing β-oxidation of fatty acids while stimulating the biosynthesis of fatty acids necessary for forming membranes of rapidly dividing cells. These metabolic changes support the energy needs of the cell and shift metabolic precursors to where they are needed to support cell proliferation. Thus far we have discussed how Akt may stimulate glycolysis, but new evidence points to a pathway by which defects in mitochondrial respiration can lead to activation of Akt . Pelicano and coworkers  demonstrated that respiration deficiency induced by mitochondrial mutagenesis, pharmacologic inhibition, or hypoxia causes inactivation of PTEN. Because PTEN is a negative regulator of Akt, inactivation of PTEN by these multiple modes of respiratory deficiency may result in activation of Akt . These cells are highly glycolytic and resistant to a number of apoptotic stimuli, and inhibition of the PI3K/Akt pathway restores sensitivity to drug-induced apoptosis . These findings indicate that impaired respiration can activate Akt, which would be expected to induce glucose import, HK activity, and glycolysis as a means to generate energy as well as induce ATP citrate lyase activity. The discussed findings are somewhat at odds with those of Bauer and coworkers , who demonstrated enhanced ATP citrate lyase activity and fatty acid synthesis (which requires NADPH) in cells expressing activated Akt, because Pelicano and coworkers argued that the inactivation of PTEN is a result of excessive NADH, which causes oxidation of PTEN due to a lack of sufficient NADPH (required to maintain PTEN in a reduced state). Further study is needed to clarify how a lack of respiration may affect levels of NADH and NADPH, and how this in turn affects PTEN, cellular metabolism, and other signaling pathways. The tumor suppressor p53 is among the genes that are frequently mutated in tumors, and it is regarded as the guardian of the genome because of its role in responding to DNA damage . Less well appreciated is the role of p53 in mediating a metabolic check point for cell cycle progression . Cells that are subjected to nutritional stress exhibit an increase in the ADP/ATP ratio, and under these conditions adenylate kinase is activated and converts two molecules of ADP into one ATP and one AMP. Although this helps to maintain a consistent ADP/ATP ratio, it also results in an increase in the ratio of AMP/ATP, which stimulates activation of AMP-activated protein kinase (AMPK). AMPK acts as a nutrient sensor that is activated under conditions of low nutrients to activate catabolic events such as β-oxidation of fatty acids and autophagy, and inhibit anabolic events such as transcription, translation, and synthesis of nucleotides and fatty acids [40, 41]. Recent studies have demonstrated that culturing cells in low glucose causes cell cycle arrest, which is mediated by AMPK in a p53-dependent manner and involves AMPK phosphorylation of p53 at Ser15 (human sequence; Figure 2) . Expression of a constitutively activated mutant of AMPK induces cell cycle arrest even in the presence of high concentrations of glucose and nutrients, whereas loss of p53 prevents cell cycle arrest induced by low glucose . This pathway also requires mTOR inactivation and both tuberous sclerosis 1 and 2 , suggesting that disruption of multiple points along this pathway might result in a loss of this metabolic checkpoint. The finding that p53 was inactivated in the majority of cancers and that the majority of tumors also exhibit the Warburg effect has stimulated two different groups to consider whether p53 may regulate glycolysis [43, 44]. Matoba and coworkers  demonstrated that synthesis of cytochrome oxidase (SCO)2 is expressed in a p53-dependent manner. SCO2 is required for the assembly of the cytochrome c oxidase complex in the mitochondria, and therefore diminished expression of SCO2 results in impaired mitochondrial respiration. As a target of p53, the level of SCO2 protein and the rate of mitochondrial respiration correlated with p53 gene dosage; p53+/+ cells had higher levels of SCO2 and respiration than did p53+/-, and p53-/- had the lowest of all. Expression of SCO2 in p53-/- cells using a heterologous promoter restored respiration, whereas targeted disruption of SCO2 in p53 wild-type cells impaired mitochondrial respiration. The inhibition of mitochondrial respiration by disrupted expression of SCO2 in p53-deficient cells results in a cell that is dependent upon glycolysis, and the impaired respiration would also be expected to activate Akt, as discussed above, and further stimulate glycolysis (Figure 2). Following a different approach, Bensaad and coworkers  identified TP53-induced glycolysis and apoptosis regulator (TIGAR) as a p53-regulated gene that might regulate the production of reactive oxygen species (ROS). Increased expression of TIGAR decreases the level of fructose-2,6-bisphosphate in a cell, which suppresses glycolysis by diverting the flow of glucose-6-phosphate to the pentose phosphate pathway. Diversion of sugars to the pentose phosphate pathway results in the generation of NADPH, which increases the concentration of reduced glutathione – an antioxidant that can scavenge ROS. Thus, p53-dependent expression of TIGAR decreases glycolytic rates and decreases the level of ROS, whereas loss of p53 function in tumor cells would be expected to decrease expression of TIGAR and thereby stimulate glycolysis and increase the concentration of ROS (Figure 2). This increase in ROS at the expense of NADPH production may cause PTEN oxidation and Akt activation in a manner similar to that discussed by Pelicano and coworkers . Increased Akt activation stimulates glycolytic energy production and fatty acid synthesis, as discussed above. It has also been observed that p53 downregulates expression of phosphoglycerate mutase (PGM; Figure 1) and that loss of p53 results in an increase in PGM expression and enhanced glycolysis . Over-expression of PGM resulted in immortalization of primary mouse embryo fibroblasts and protected them from Ras-induced senescence, although expression of PGM did not result in cellular transformation. Consistent with this model, pharmacologic inhibition of PGM inhibits glycolytic flux and results in cell cycle arrest . Loss of p53 is a common occurrence in tumor cells and has profound affects on DNA damage repair, cell cycle arrest, and apoptosis . However, loss of p53 also results in increased glycolysis via loss of SCO2 expression, which impairs the respiration machinery, leaving glycolysis as the major source of ATP production; via loss of TIGAR expression, which results in reduced shuttling of glucose to the pentose phosphate pathway and more glycolysis; and via increased PGM expression, which also activates glycolysis (Figure 2). The conversion of pyruvate to lactate, mediated by lactate dehydrogenase (LDH), normally only occurs under conditions in which oxygen is limited, because this prevents extraction of the maximum amount of energy from glucose. The notable exception is tumor cells where lactate accumulates, reflecting the altered balance between glycolysis and oxidative phosphorylation. Fantin and colleagues  explored the effect of reducing expression of LDH-A in Neu-transformed mammary tumor cells derived from MMTV-Neu transgenic mice . The proliferation of tumor cells lacking expression of LDH-A and control tumor cells were identical under normoxic conditions, but tumor cells lacking LDH-A proliferated at a greatly reduced rate under hypoxic conditions, which correlated with reduced cellular concentration of ATP and increased mitochondrial respiration. Using a tumor cell mammary gland transplant model, a very significant decrease in tumor growth rate and an increase in animal survival were observed using LDH-A knockdown tumor cells in comparison with tumorigenesis induced by the unmodified control tumor cells  (Figure 2). Increased expression of LDH in tumor cells may be a critical part of the metabolic reprogramming that occurs during tumorigenesis, and it has been shown that expression of LDH can be directly induced by oncogenes such as c-Myc , or indirectly via activation of HIF-1α . Targeting expression of LDH or inhibiting LDH could help to restore metabolic balance, but more importantly it may diminish the ability of tumor cells to survive under conditions of hypoxia. Another key enzyme involved in glycolysis that may accelerate glucose metabolism in cancer cells is pyruvate kinase type M2 (M2-PK). M2-PK is characteristically expressed in cells of the lung, cells with high rates of nucleic acid synthesis, and tumor cells . Expression of M2-PK can be stimulated by hypoxia and oncogenes such as Ras, Src, and human papilloma virus gene E7 . This as a theme reminiscent of LDH described above, in which oncogene-induced expression of LDH or M2-PK could be further enhanced by hypoxia resulting from increased tumor volume driven by pro-growth oncogenes. Although the Warburg effect has been recognized since the 1920s, less well appreciated are alterations in lipid metabolism and the high rates of de novo fatty acid biosynthesis exhibited by many tumors . Labeling studies indicate that the majority of fatty acids in cancer cells are derived from de novo synthesis regardless of the concentration of extra-cellular lipids, which primarily reflects dietary fats [52, 53]. The enzymatic activity of ATP citrate lyase [35, 54] and fatty acid synthase (FASN) are increased to support the synthesis of fatty acids. FASN was identified as the breast tumor associated protein OA-519, and numerous studies have shown that it is over-expressed in tumors, including breast carcinomas [55–58]. Although it is thought that increased fatty acid biosynthesis is required to support the synthesis of new membranes, experimental evidence to support this contention is lacking [56, 59–61]. Lipogenic breast tumors, defined by high level expression of FASN, carry a poor clinical prognosis , but it is not clear whether expression of FASN plays a causal role in disease or whether it reflects other underlying metabolic changes in such tumors. Discussed above is the role of PI3K/Akt in stimulating fatty acid synthesis via activation of ATP citrate lyase and inhibition of fatty acid β-oxidation via reduced expression of CPT1A. Along a similar line as CPT1A, mouse mammary tumor models and human primary breast cancer often exhibit diminished expression of DecR1 (2,4-dienoyl-coenzyme A reductase), another enzyme involved in fatty acid β-oxidation . Ectopic expression of DecR1 in a mouse mammary carcinoma model reduces tumor growth and decreases de novo fatty acid synthesis, although it does not reduce glucose uptake by tumor cells , reinforcing the therapeutic potential of targeting tumor cell fatty acid synthesis. Spot 14 was originally identified as a protein induced by thyroid hormone , which is highly expressed in tissues that actively synthesize fatty acids such as the adipose, liver, and the lactating mammary gland [65–67]. Spot 14 knockout mice exhibit lower levels of medium chain fatty acids in the milk, which is thought to be due to suppression of de novo synthesis of fatty acids in mammary epithelial cells . Spot 14 expression is elevated in the mammary glands of MMTV-myr-Akt1 transgenic mice, which exhibit precocious lipid biosynthesis during pregnancy (Rudolph MC, Anderson SM, unpublished data) and which have a milk fat content that is two to three times that of wild-type mice . The mechanism by which Akt activates lipid synthesis is unclear but may require Spot 14 and/or sterol response element binding protein, which is a transcription factor that induces cholesterol and fatty acid biosynthesis downstream of Akt activation . Analysis of human breast tumors has revealed that expression of Spot 14 is correlated with higher metastatic potential and poorer clinical outcome [70, 71]. As with the expression of FASN in tumors, there is no mechanistic explanation for why expression of Spot 14 would correlate with increased metastatic potential and poor clinical outcome, although their influence on fatty acid biosynthesis may be part of the reason. It remains to be determined whether Spot 14 functions to modulate FASN activity, or whether it can regulate transcription of fatty acids. It is clear that cancer cells have altered metabolism, and although progress has been made in recent years toward identifying molecules that may underlie the changes in metabolic regulation, it is also becoming clear that each of these molecules may interact in overlapping and reinforcing manners to ensure that these metabolic changes continue in tumor cells. Tumorigenesis is an increasingly complex dance of molecules in which pathways regulating metabolism intersect with many other known pathways, such as oncogene signaling, evasion of apoptosis, and angiogenesis. Clearly, more details remain to be elucidated and the critical therapeutic targets remain to be identified. Otto Warburg was the first to appreciate the aerobic glycolytic phenotype of cancer cells, and although people have pointed out that his hypothesis was wrong, one can see that there are mechanisms by which such mitochondrial damage does promote the program of metabolic changes that may favor tumorigenesis or metastasis. In the absence of knowledge about the importance of oncogenes and tumor suppressor genes as genetic causes of tumorigenesis, his insight is remarkable and new data demonstrate that Warburg may not have been as far off base as some have suggested in recent years. The fact that loss of p53 causes a loss of mitochondrial oxidative phosphorylation through decreased expression of SCO2 demonstrates a mitochondrial basis for the Warburg effect . In spite of the advances discussed above, there are numerous questions that merit investigation. What other oncogenes or tumor suppressor genes reduce expression of mitochondrial enzymes that could result in suppression of mitochondrial respiration? How frequently are mitochondria nonfunctional in tumor cells? Are the enzymes of citric acid cycle or respiratory chain enzymes targeted frequently? Does hypoxia supersede the effects of the PI3K/Akt/mTOR pathway on metabolism? Is GLUT1 the critical glucose transporter in tumor cells or do other transporter make major contributions to the Warburg effect? What factors activate other glucose transporters? Does loss of functional BRCA1 or BRCA2 stimulate the Warburg effect? Is the metabolism of 'cancer stem cells' altered, or does that occur later during tumor progression? Does secretion of lactate by tumor cells, and the resulting extracellular acidosis, play a role in tumor cell invasion and metastasis? Would blocking lactate transport result in intracellular acidosis and kill the tumor cell? Is inhibition of β-oxidation of fatty acids required to redirect lipid metabolism? Does DecR1 play a universal role in modifying lipid biosynthesis? Is the lipogenic phenotype of tumor cells driven by transcriptional events? Is there a role for sterol response element binding protein or SPOT 14 in tumorigenesis or metastasis? Do steroid hormones alter the metabolism of breast cancer cells? Finally, what metabolic changes are universal in tumorigenesis and what changes are organ-specific? The answers to these questions will provide new insights into tumor cell biology and may identify critical therapeutic targets that inhibit tumor cell proliferation as well as tumor invasion and metastasis. Warburg would have loved to have known the answers to these questions. TP53-induced glycolysis and apoptosis regulator. The authors should like to thank Lisa Litzenberger for her artistic talent and contribution to generating figures, as well as the members of the Anderson laboratory and the members of the Mammary Gland Program Project Grant at the University of Colorado Health Sciences Center for discussions and encouragement of our research. This work was supported by the grants BCTR0600727 from the Susan G Komen Foundation, and P01HD38129 from the Public Health Service to SMA. CDY is supported by a Predoctoral Fellowship from the US Army Breast Cancer Research Program (BC051149).